Benefits of Well-Designed Medical and Dental Computer Mounts | ICWUSA.com Inc.
Wall mounted computer workstation in a patient room. Well designed, ergonomic mounting arms improve efficiency and enhance caregiver comfort and safety. Computer use and MSDs. Awareness of the relationship between increased computer use and Muskuloskeletal Disorders (MSDs) in healthcare and dental environments has brought proper ergonomics to the forefront when selecting computer mounting systems. Limited space. The growing use of computers, monitors and carts has created space restriction problems. Meeting patient needs. Whether entertaining patients or presenting them with information, one static location for a monitor or TV will not meet the needs of every patient. With better knowledge of workplace-related injuries such as carpal tunnel syndrome, lower back, neck and shoulder pain, healthcare and dental managers are recognizing the need to provide ergonomically correct workplaces for their staff. The simple definition of ergonomics is the adaptation of the workplace to the worker. Mounting systems need to adapt equipment to the people who use it. Because people’s physical proportions vary considerably, mounting systems need to easily adjust for each caregiver. Administrative and patient care tasks are handled more safely and efficiently with ergonomically designed computer and monitor mounts. Proper ergonomics can also save money through fewer missed days due to injury and increased productivity because employees are comfortable in their work environment. Often the first question that comes to mind before the purchase of a computer or monitor mounting system is, “Where will we put it?” In medical and dental environments, space is a valuable commodity. In an administrative or IT area, if a keyboard is placed at the edge of the table and a monitor behind the keyboard, the actual usable workspace has been greatly reduced. In some instances a second or third monitor is needed, compounding the problem. In hospital patient rooms and dental operatories, it’s often impractical to use a second cart or cabinet for a computer, monitor, keyboard or laptop. Every square inch of floor and desk space has already been allocated for other equipment and tasks. Stowable mounting solutions provide complete workstations that mount in minimal space and fold up and out of the way when not in use. Desk and floor space remain clear. Wall mounted computer workstation and ceiling mounted monitor improve efficiency in a healthcare setting. Wall mounted monitor in a dental operatory makes it easier to share images with the patient. Articulating monitor mounts in medical and dental settings enable caregivers to easily share information with patients. Appropriately selected monitor and computer mounting solutions can improve caregiver efficiency by streamlining workflow and maximizing the area they have to do their work. Ergonomically designed mounting solutions increase the comfort, health and safety of staff in clinic and patient rooms, nurses stations, administrative areas, diagnostic sites and operatories. A monitor mounted to an adjustable arm makes it easy for a patient to enjoy television even if his/her mobility is limited. The patient no longer has to be moved to see the screen because the screen can be moved to where the patient can view it. An extendable monitor arm can enable a caregiver to use the monitor to educate a patient about a treatment or help him/her view x-rays from a bed or chair. This mounting system makes it easier to engage a patient in the treatment process. The same mounting system can then lift the monitor high enough to be used by caregivers or colleagues to discuss treatment plans. 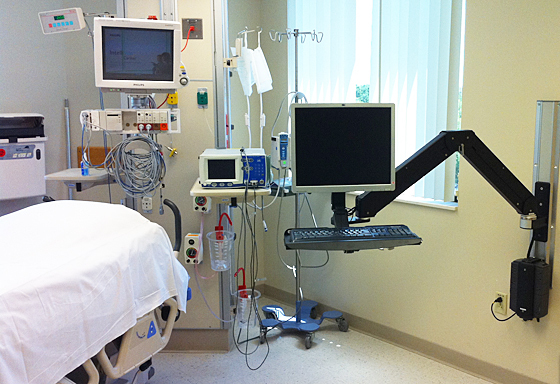 There are many monitor and computer mounting arms and stands on the market designed for an array of applications in healthcare and dental environments. It’s important to know exactly what mounting solution will match facility and caregiver needs. The following are points to keep in mind when looking for a mounting system. Compatibility. There are compatibility standards set forth by VESA, the Video Electronics Standard Association, that determine how a flat panel monitor can be mounted. Be sure to find a mounting interface that’s VESA compliant and compatible with the monitor. Also keep in mind the weight of the equipment that will be mounted and choose a mounting system that meets the load capacity. The right monitor and computer mounting system can transform a healthcare or dental practice. It can enrich the experience of patients and create a safer, more efficient workplace for employees.